Outside of Downtown, Milwaukee Avenue is likely the fastest growing and changing thoroughfare in the city, and it isn’t the first time in history it’s had this position. Since the early beginnings of Chicago, it’s been a busy commuting path and one of the most bustling commercial centers. What Soho is to London this diagonal avenue is to the Garden City. By turns the Greek, Italian, German, Scandinavian, Russian, Lithuanian and Pole monopolize the street signs, the corner news-stands, the sidewalks and the cars, or proclaim to the passing nose one aspect of their national delicacies. Every half-section line exhibits in its ganglia, as the crossing of the thoroughfares, a sharp-angled picturesque frontage, akin to Seven Dials or Five Points in their palmy days. In the first part of this series, we’ll look at the early history of Milwaukee Avenue, and follow it until the boom years of the 1920s. Next we’ll cover the Chicago School of architecture, and later, the transition to the Machine Age and Art Deco. The most obvious feature of this arterial road is its path, running diagonal to the city’s grid network of streets. Though many believe the grid system came as a result of planning after the Great Fire, it actually dates to the original surveying of the city in 1830. This early date of the grid makes this conspicuous diagonal path (especially to pedestrians) even more puzzling. The simplest answer to this minor riddle is the correct one–Milwaukee Avenue existed long before the City of Chicago did. 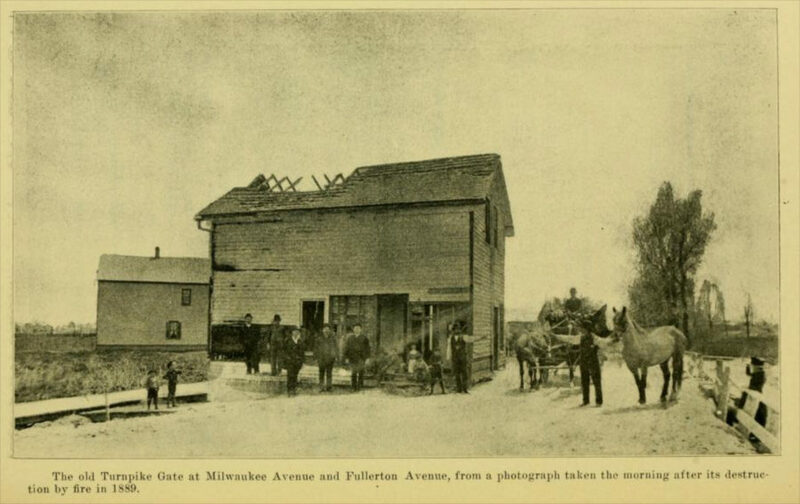 Like street names all over the country, its namesake comes from another city: Milwaukee. Not specifically because it leads there, though it does via a circuitous route. Milwaukee Avenue originated as an indian trail, used for centuries by the original inhabitants of Illinois. The path may have been originally created by animals seeking the waters of Lake Michigan. The 1829 Treaty of Prairie du Chien took the land away from Native Americans, opening up potential for land ownership and profit. After the treaty, European settlers arrived in droves to areas northwest of the city in the early 1830s. With newly available land acquired from its original inhabitants, settlers headed northwest in search of opportunity. At best, the path was slow and difficult to navigate. At worst, travel was impossible. Construction of the Northwestern Plank Road began in 1849, charging travelers for use. In 1865, A.J. Snell purchased the old plank road and added gravel. For decades he operated a profitable system of exacting tolls from those passing through the Northwest Turnpike, but rarely invested in its upkeep or improvement. By the late 1880s, it was referred to as Snell toll road. The system of tolls was despised by farmers and other residents who had no other option to reach their destination. Snell was murdered in an apparent robbery in 1889, and his heirs continued collect tolls despite the poor condition and legal challenges to its existence. In 1890 (contradictory to the date in the above photo), a mob of 200 or so warned the gatekeeper to exit the building, and burned it down in glee and celebration. A court later ruled against the Snell heirs. The court stated current residents had no choice in the selection process of choosing a company to maintain the road, as result of development growing rapidly around it. The mob action and court decree marked a decisive end of the thoroughfare as a toll road. Before the removal of the toll house, transit laid the foundation of rapid access to Downtown from the Northwest Side. 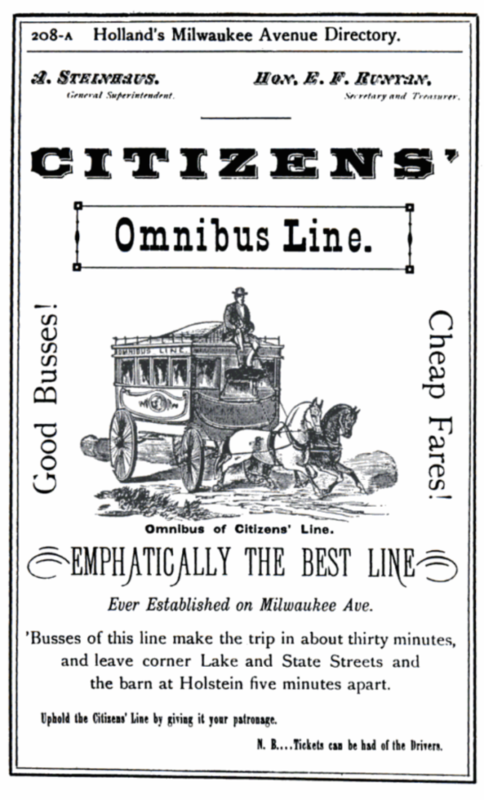 The Steinhouse’s Citizen’s Omnibus Line (above) provided horse-drawn coaches in 1874, with a travel time of about 30 minutes from Downtown to North and Damen Avenues. 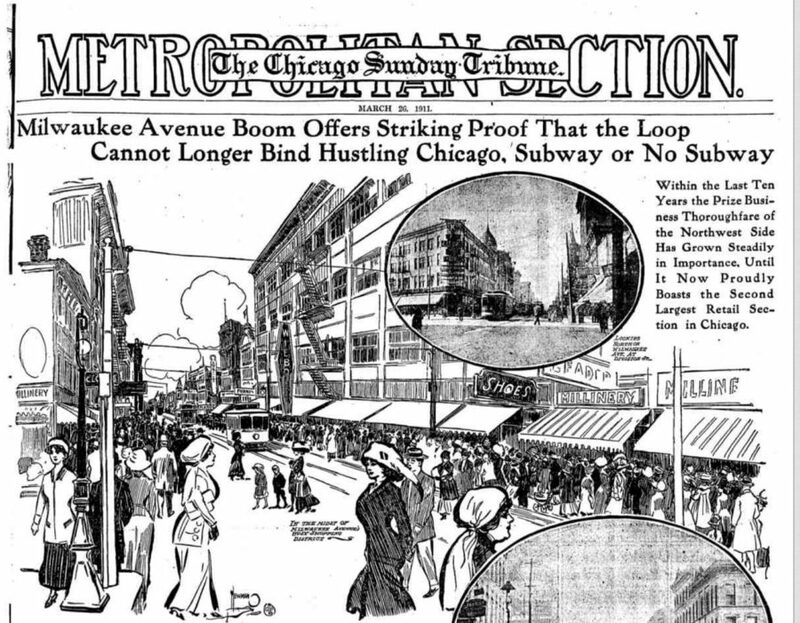 The removal of tolls, addition of streetcars, and the new Milwaukee Elevated Line transformed Milwaukee Avenue at the turn of the century into a bustling thoroughfare that provided quick access from suburban neighborhoods to downtown. 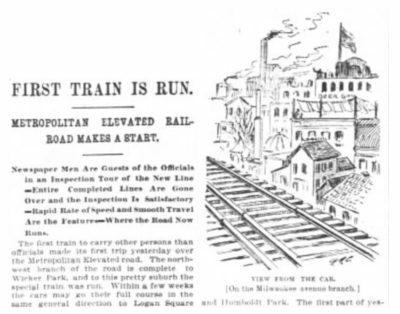 In 1895 the Metropolitan West Side Elevated Railroad built the first electric elevated line in Chicago. 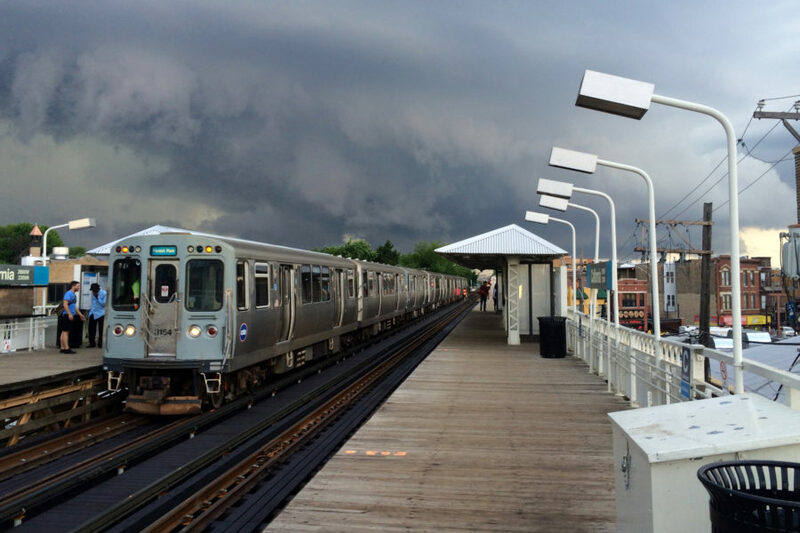 This electric line had branches that left downtown for Garfield Park, Humboldt Park, Logan Square, and Douglas Park. Several branches of the original Metropolitan Elevated operate today along the Blue and Pink Lines. The platform and station house of the California stop on the Blue Line looks a lot like the way it did when it opened in 1895. The California Station was extensively renovated in 2014. 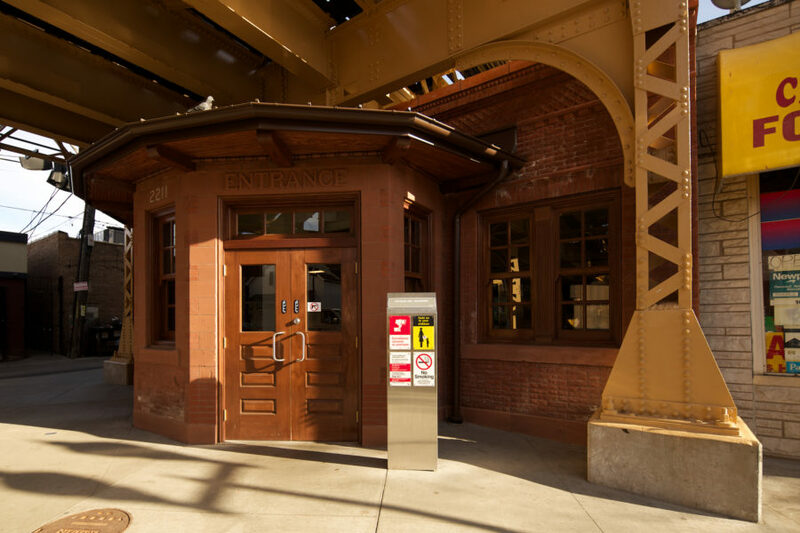 The platform, entrance, and station house were rehabbed as a part of the Your New Blue project with new materials, while retaining the same appearance. 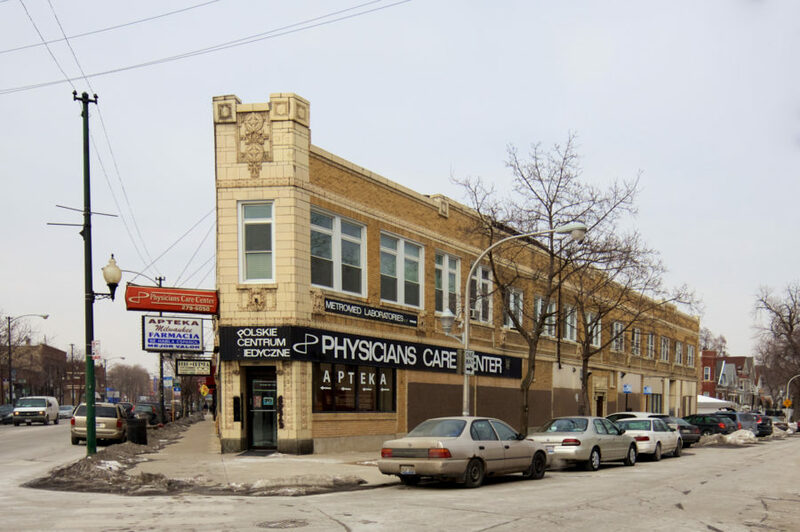 The early ethnic makeup of Milwaukee Avenue’s settlement was largely German, after several waves of immigration to Chicago. New German immigrants established saloons, hardware stores, bakeries, and clothing stores. 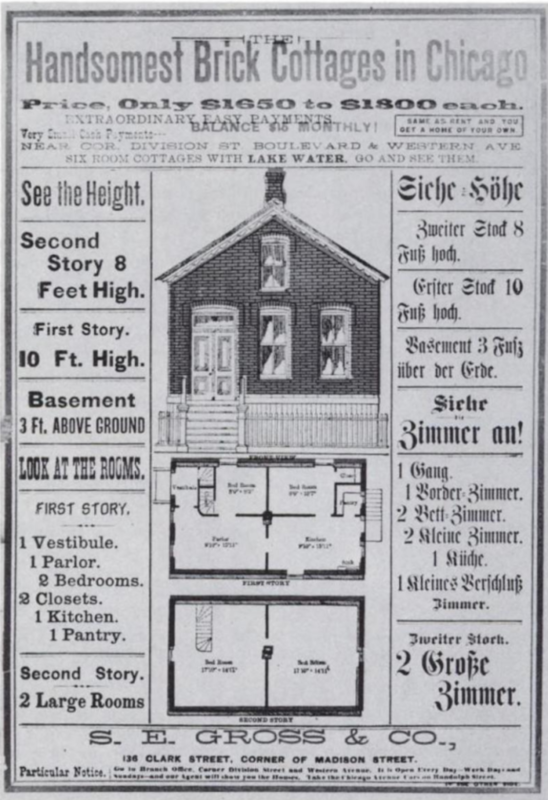 Along Milwaukee Avenue closer to Downtown in the 1870s-1890s, the German population was so prevalent that real estate advertisements appeared in both German and English. Many of the architectural artifacts of German culture were social halls, such as Aurora Turner Hall (above). Oddfellows Halls, Masonic Halls, and Turner Halls (Turnverein) were forming as a place for leisure, organization, and support. 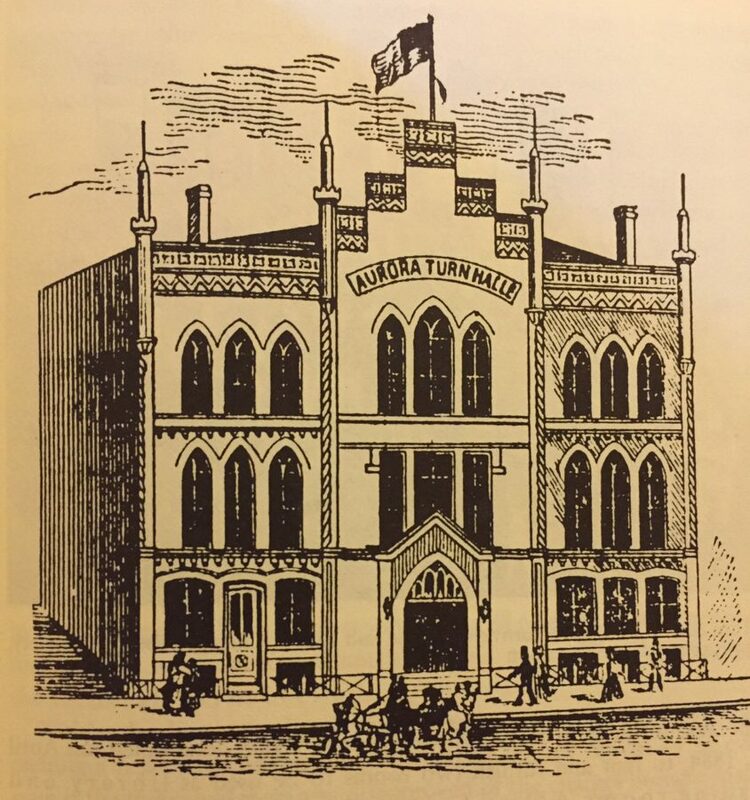 For more on the Turnverein, see our recent article Chicago’s Forgotten Turner Halls: Turnverein Vorwaerts. 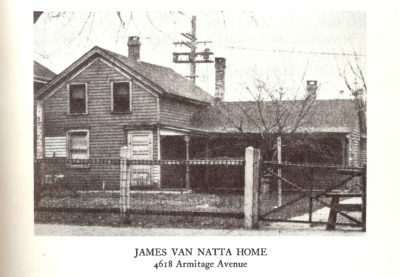 As more immigrants from other countries arrived along Milwaukee Avenue, early German arrivals forged a path to the northwest toward suburban or rural areas. One destination on this path was Irving Park. The arrival of Germans (along with the Swedes) tripled the population between 1910 and 1920–from 14,748 to 42,467. One of the remnants of this rapid expansion is the nationally landmarked Carl Schurz High School at Milwaukee and Addison. An expanding population needed a larger school, and Carl Schurz would be the namesake for the new school. Schurz, a German immigrant, had no connection to Chicago but was a General in the Civil War, a Senator, and Secretary of the Interior, among other titles. 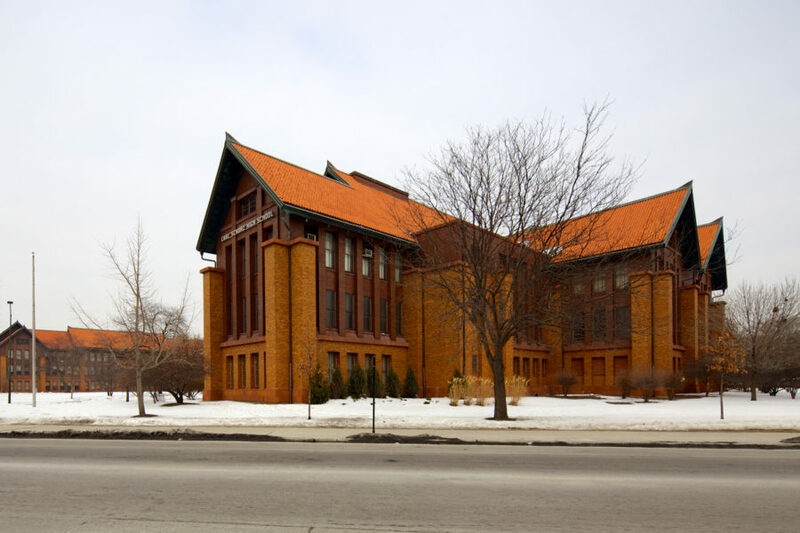 Designed by Dwight Perkins, this near-perfectly preserved structure represents a blending of the Chicago School and Prairie School styles of architecture. Today, roughly 1,200 students are enrolled. The Chicago School is the next topic we’ll cover on this series of architecture history of Milwaukee Avenue. Toward the end of the 19th century, Scandinavians arrived to neighborhoods along Milwaukee, in particular the Norwegians in Logan Square. 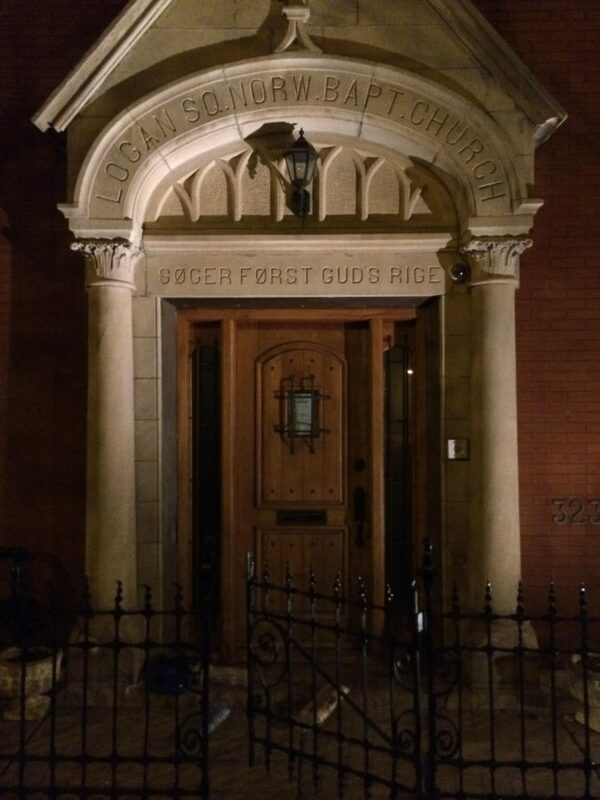 The most visible artifact of early Scandinavian immigration is Minnikirken, a Norwegian Lutheran Church facing Logan Square. 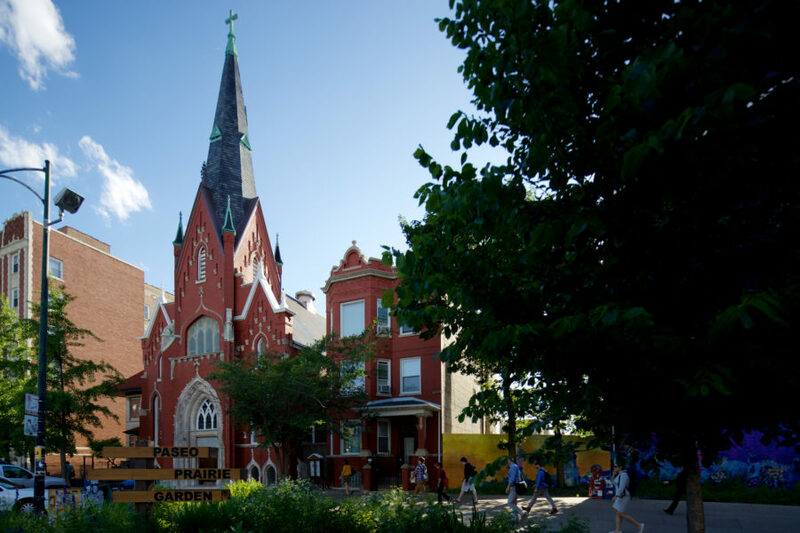 This grand and beautiful symbol of Norwegian immigrant history has a vibrant church membership, bringing visitors from outside the neighborhood for worship and social events. Minnekirken holds services in both Norwegian and English during the same service. 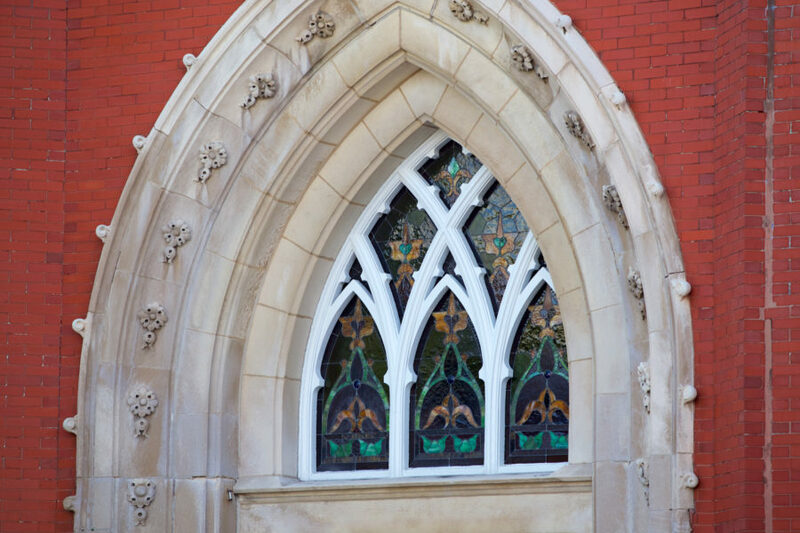 The art glass windows of the church were recently restored with help from Logan Square Preservation. 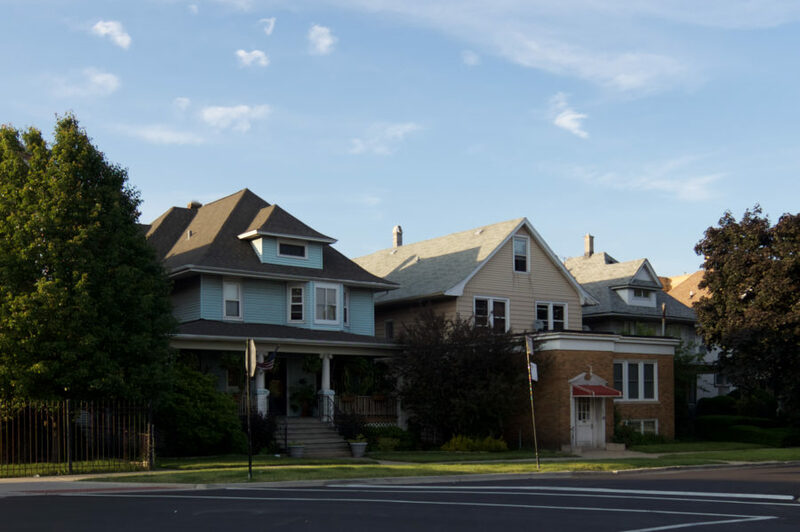 Though most of the Norwegian families and their descendants left Logan Square for suburban areas, there are still a few in the neighborhood. More [Polish] settlers came after the inaugurations of Bismarck’s anti-Polish policy during the 70s, which drove out some 30,000 Poles from Prussian Poland. After that, the numbers that came in gradually increased until there were 52,000 foreign-born Poles in 1890, and 250,000 in July, 1903! […] The 1930 census places the figure well over 400,000. Milwaukee Avenue is perhaps best known for its large Polish population, from West Town to Jefferson Park and well into the suburbs. 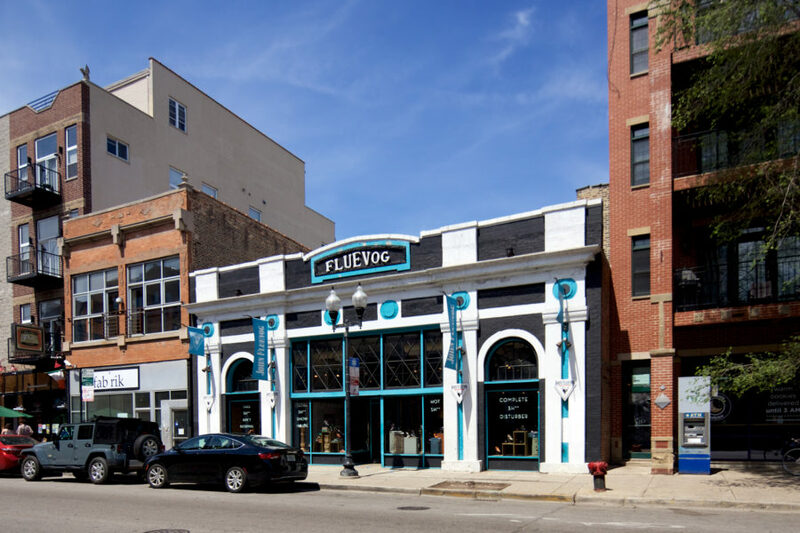 Some of the reasons for Milwaukee Avenue’s attraction to Polish immigrants was the growth of industry, as well as the ease of access to industrial jobs downtown. One of the earliest draws was also the location of its churches. 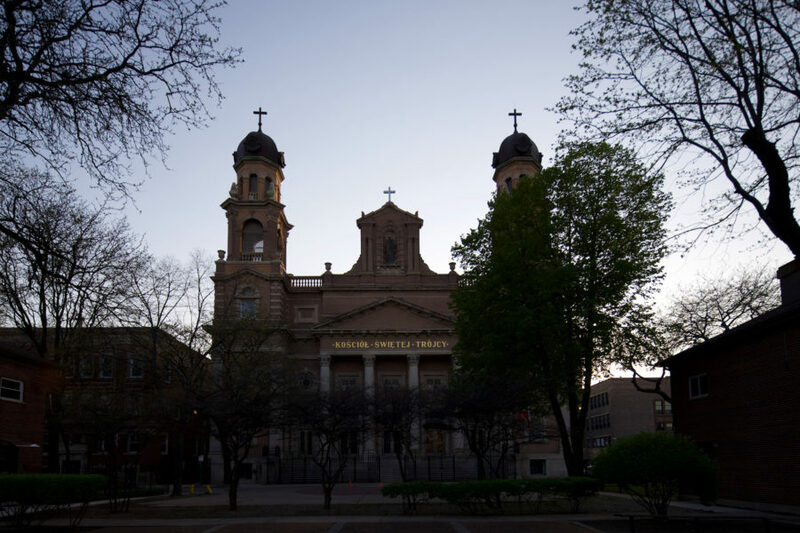 St. Stanislaus Kostka Church, the first Polish parish in Chicago founded in 1867, is located several blocks northwest of Milwaukee Avenue in Pulaski Park. Holy Trinity Church (above) is about a block north of Milwaukee, at 1118 North Noble Street. 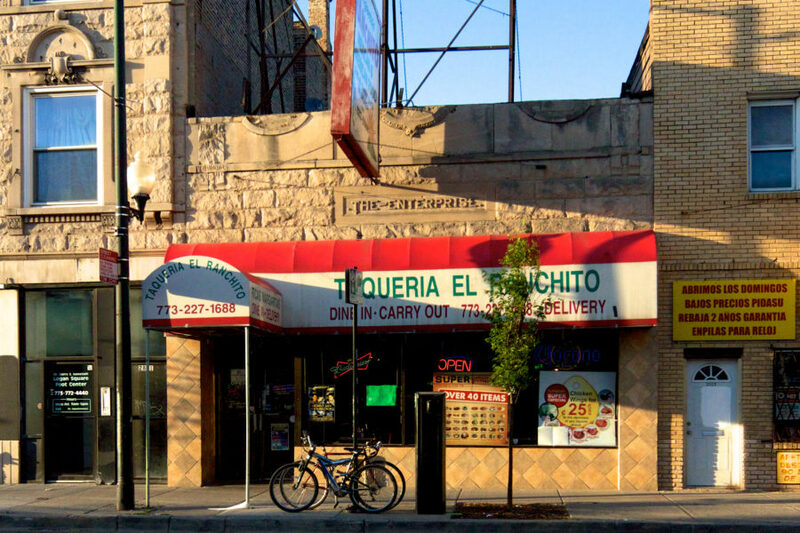 Over the decades, earlier arrivals and their descendants continued moving northwest along Milwaukee Avenue, past Avondale, into Jefferson Park, and then the suburbs. Grand houses of worship, businesses, and restaurants cater to a group that continues to arrive in Chicago today. Though immigration has slowed significantly, Poland remains the second highest country of origin for immigrants in Chicago and Illinois. We’ll continue to study the legacy of Polish immigration to Chicago in the third part of this series. The rapid arrival of so many immigrants to Milwaukee Avenue around the turn of the century led to an economic boom. The wealth created by immigrants attracted to transit and housing built upon itself, leading to Milwaukee Avenue becoming the second largest economic district in Chicago, outside of Loop (noted above). With many of the area’s residents traveling during rush hour for destinations along Milwaukee Avenue and places downtown, it earned the nickname Dinner Pail Avenue. The Dinner Pail avenue army is only one of a hundred battalions marching on the downtown section of Chicago at this moment from every part of the city. They pour out of modest homes, from brick and wood cottages, from back alleys and side streets, from modest workingmen’s flats, to swell the invasion. […] Nearly every unit in this Milwaukee avenue host carries its means of sustenance with it, and as we watch we see that the variety of the dinner pails alone is astonishing. 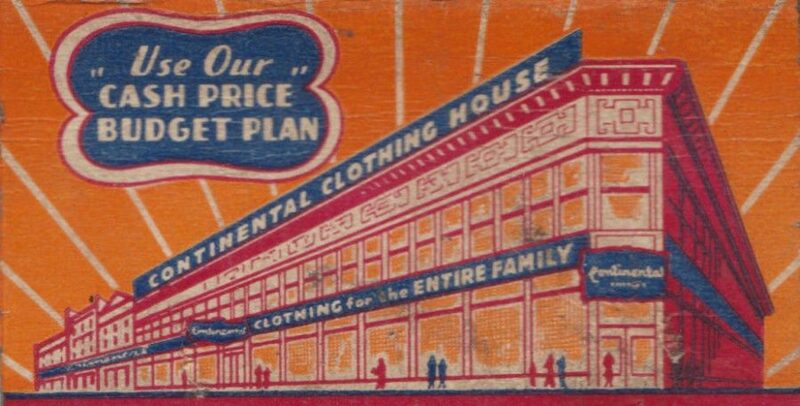 Along Milwaukee, many of the industries that arose were centered around clothing and furniture. Though a few are active today, they are becoming increasingly scarce as a result of rising land values. Milwaukee Avenue, notably the great centers created by the intersecting thoroughfares, is a stable investment because of the fact that it is an active business thoroughfare; because further it is backed up by an industrious and thrifty class of people who save their money and pay their bills; moreover there are so many of them and they are so dependable that the big merchants have made themselves big by supplying their wants in the way of substantial merchandise at low prices. This is what is making Milwaukee Avenue the substantial center it is for the transaction of general business. In the bedroom there was nothing to be seen save the nearby berths just below the ceiling. These were about two feet wide and were comprised of the plank base, a straw mattress, and a blanket. The bed things look as though they had been dragged around a stockyards and then washed in the Chicago River. Rodents also made their home here, something which could be quickly ascertained. The Worker’s Cottage, a 1 and 1/2 story house with a gabled roof, was marketed as an affordable way to escape the living conditions in poorly maintained tenement houses. Many of these appeared on the streets connecting to Milwaukee Avenue, as workers left the center city in search of a better life. 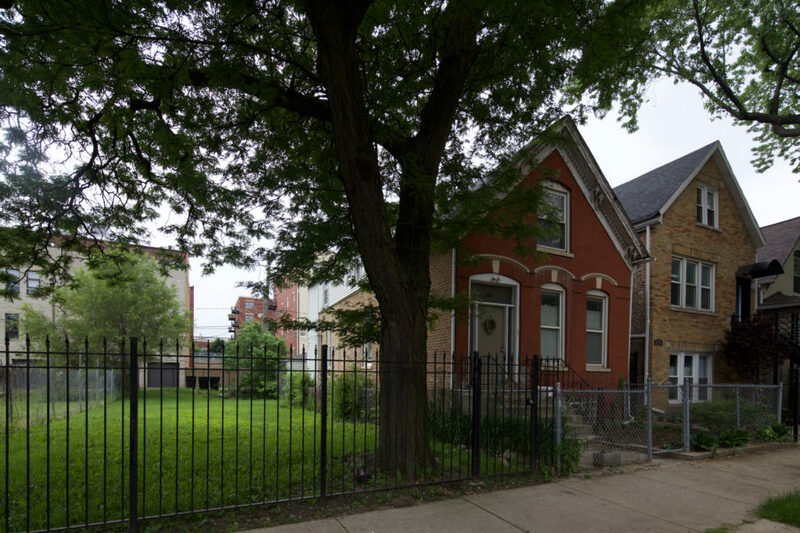 In areas along Milwaukee Avenue where they first appeared, these cottages are rapidly disappearing as larger single family homes take their place. Unfortunately, the modest workers cottage receives barely any appreciation today. 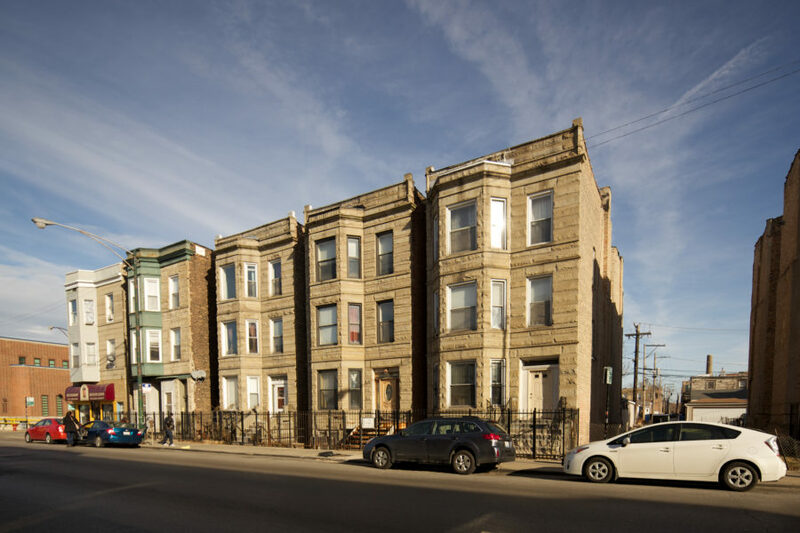 But during the time of its proliferation across Chicago, it was an almost palatial estate compared to the overnight hotels and boarding houses: 10 ft. ceilings, large rooms, and basements above ground level. Appearing as a slightly taller variant of the Worker’s Cottage, multistory Italianate row homes appear along residential side streets of Milwaukee Avenue closer to the city center. Many were separate units, allowing owner-occupied rentals. 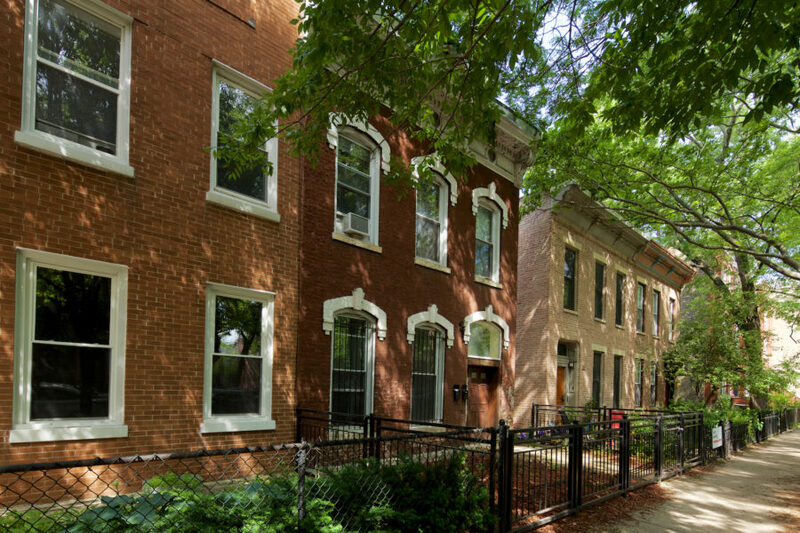 Similar to the Worker’s Cottage, older row homes are becoming more scarce as larger single family homes take their place. Many new immigrants sought out their fortune in Chicago, and a few found it. They were considered “new money” by the established elite and wealthy residents of the South and West sides. This label barred them from building homes there, so they chose areas along boulevards and near parks for their grand homes. 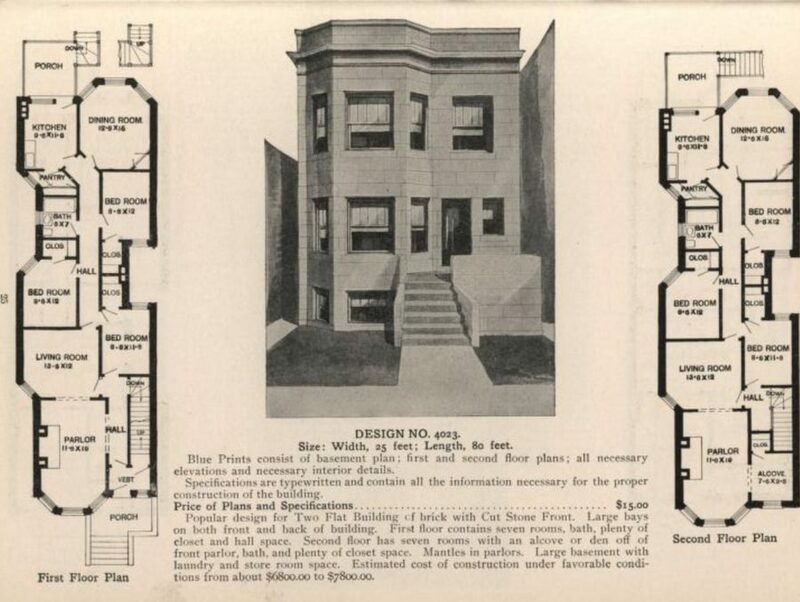 There are few buildings which represent early housing in Chicago as much as the greystone two or three-flat. Living in a two/three-flat proved then as it does now to be a wise investment: friends, relatives, or tenants pay part or all of the mortgage. The multistory brick or greystone building with bay windows is likely the most common configuration, perhaps as a result of the 25×125 lot size. This shape allows the largest footprint possible. With a bay window, light fills front rooms from all angles. 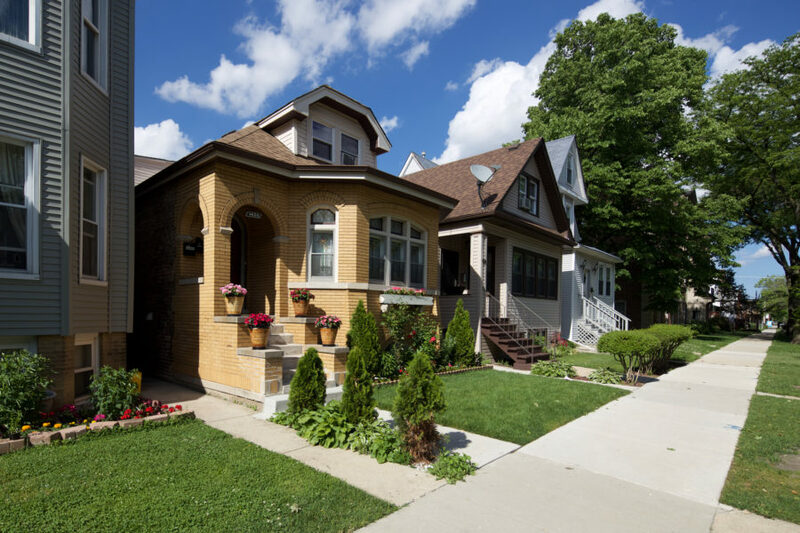 As you leave the center city and head past Avondale, the prevalence of two and three-flats starts to give way to single family housing, frequently in the form of the Chicago Bungalow. 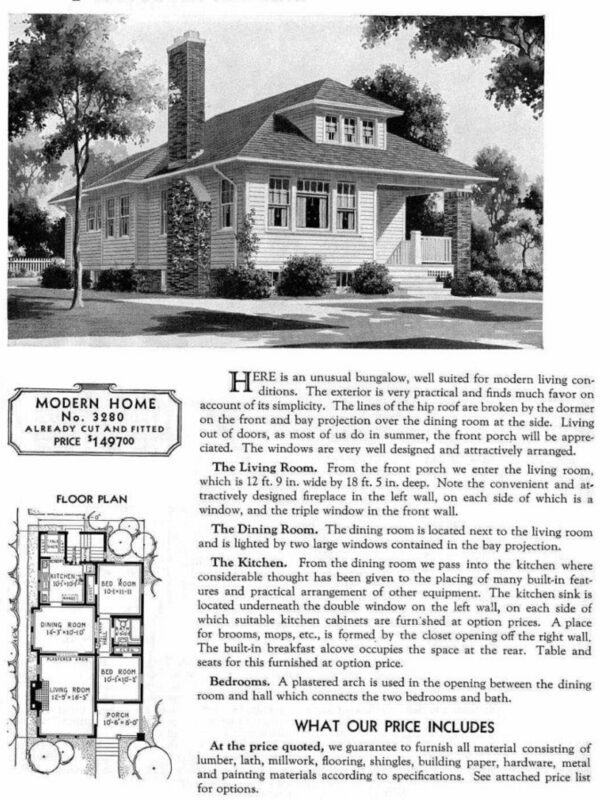 For many, the bungalow represented that a family had made it–leaving the crowded city and having space without sharing a wall with neighbors. home, or as in the plans above, a multi-unit building where each unit features two stories of living. 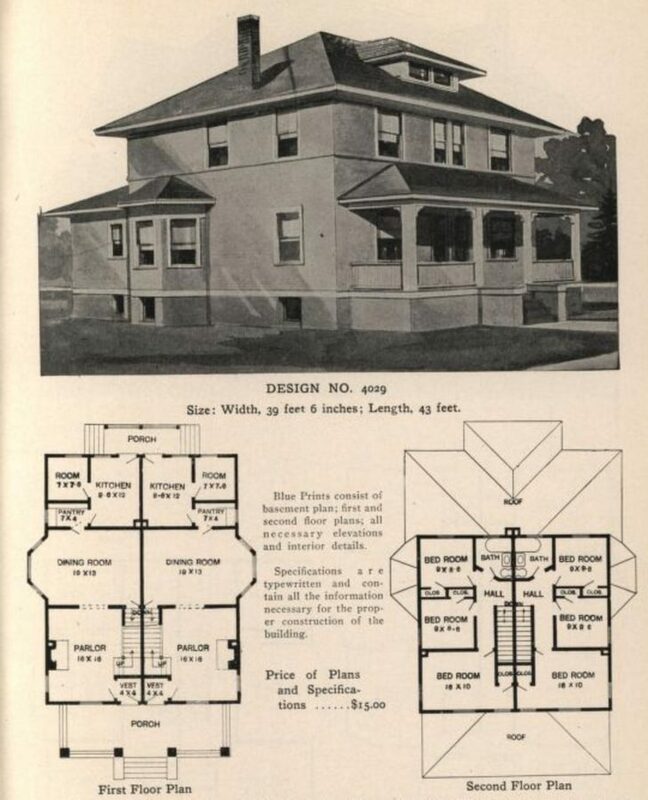 While many of these homes could be ordered in kit form from outlets such as Radford’s or Sears, the American Four Square frequently emphasized hand-made details and woodwork–a rebellion against the sometimes lavishly applied machine-made ornament of earlier Victorian styles. A Chicago Tribune article from Dec. 13, 1912, mentions that 635 theaters of all sizes and classes operated in the city. Many were on Milwaukee Avenue, and a few buildings remain today, serving as a link to the cinematic past of a century ago. Before the large movie palaces, nickelodeons gave neighborhoods a movie experience. Most were small rectangular rooms with few amenities. Also known as “loft theaters,” they were in neighborhood buildings and charged five cents for admission. Nickelodeons burst on the scene rapidly, expanding into all neighborhoods and cities across the country. They disappeared rapidly as Hollywood integrated movie making and the places showing films. For more history of nickelodeons, see our previous post, Avondale’s Forgotten Nickelodeon: The Enterprise. One surviving and interesting remnant of the Nickelodeon Era is The Enterprise (above) in Avondale. Originally a multistory and multi-use building, today all that remains is the first floor. 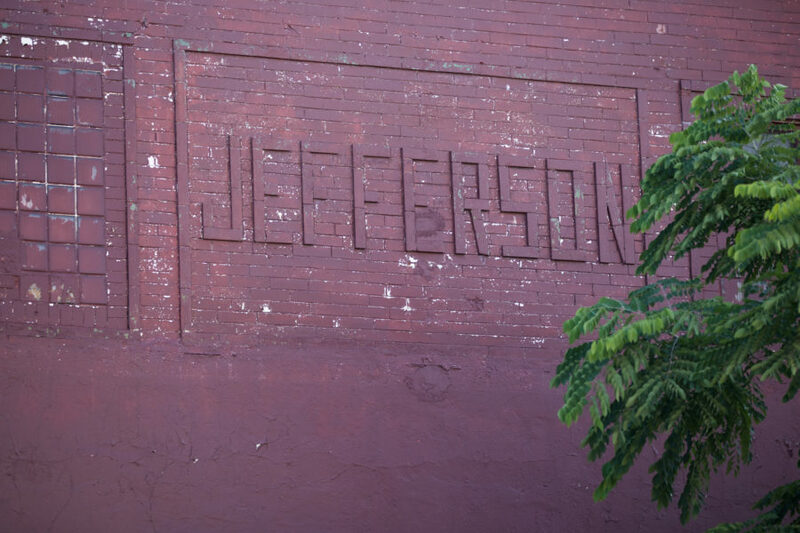 According to Cinema Treasures, the Jefferson Theatre at Milwaukee and Lawrence opened in 1914 with a capacity of 294. 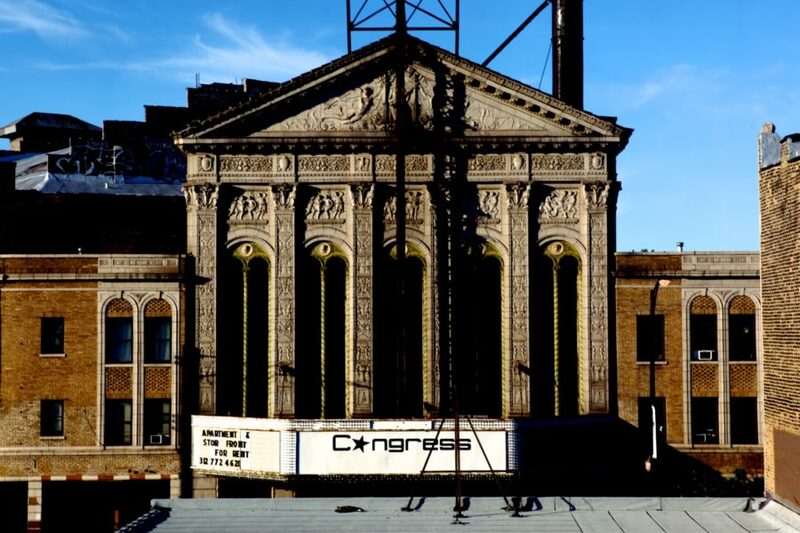 It was renamed the Progress Theatre in 1917 before ultimately closing in 1923. Though barely visible today, the name of the nickelodeon is emblazoned on the facade in brick. 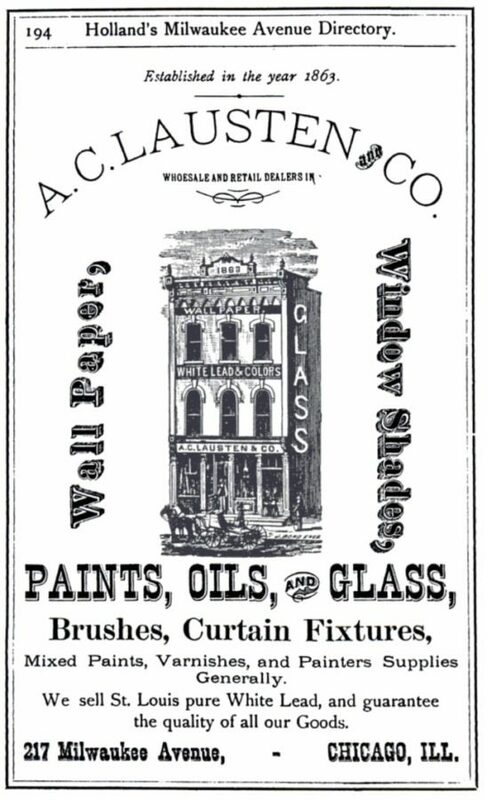 Sadly, the name and glass block have been painted over several times, hiding a clue to this building’s past. The Home Theater (also known as Home 5 Cent Theater) at 1539 N. Milwaukee opened in 1912, and is a beautiful extant example of the transition between the storefront theater era and the age of the dedicated movie theater. Most nickelodeons were storefronts converted with chairs and a projector, but the Home Theater was designed specifically for this purpose. 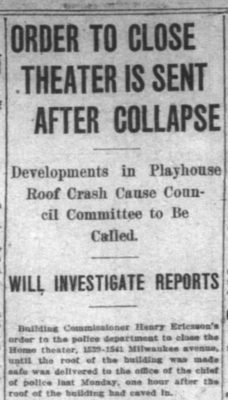 The Home Theater on Milwaukee became infamous for an engineering disaster which put the architect and engineer of the building in the hot seat after the roof collapsed. Newspaper accounts of the time called it “perilous” or a “deadly disaster,” but there isn’t mention of anyone actually losing their life in the accident. The architect, David Saul Klafter, faced a lawsuit and public hearings were held over inspections and the design. He was eventually cleared of all wrongdoing, and the theater was renamed “Bell Theater” in 1914. Today it is home to John Fluevog Shoes. The First World War and Hollywood’s integration of movie houses and film production marked a quick end to Nickelodeon era of movie theaters in 1915. By the 1920s, the experience of watching a motion picture evolved from a makeshift storefront with chairs and a projector to a purpose-built structure that dazzled with exterior ornament and provided a comfortable movie watching experience. The building of the Chopin Theatre was designed in 1918 by M.F. Strunch Architects as a 987 seat theater at 1541-1543 W. Division. 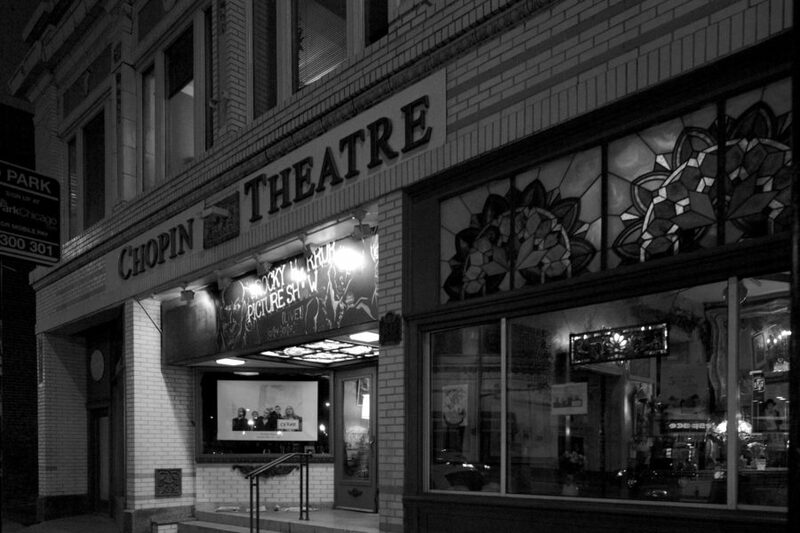 According to the Theatre Historical Society of America, the theatre’s name has changed several times over the years from Chopin Theatre to Harding Theatre, back to Chopin Theatre and then to the Pix Theatre from 1940-1948. During the next 40 years it went through a number of alternate uses: Security Federal Savings and Loan; thrift shop, discotheque, etc. 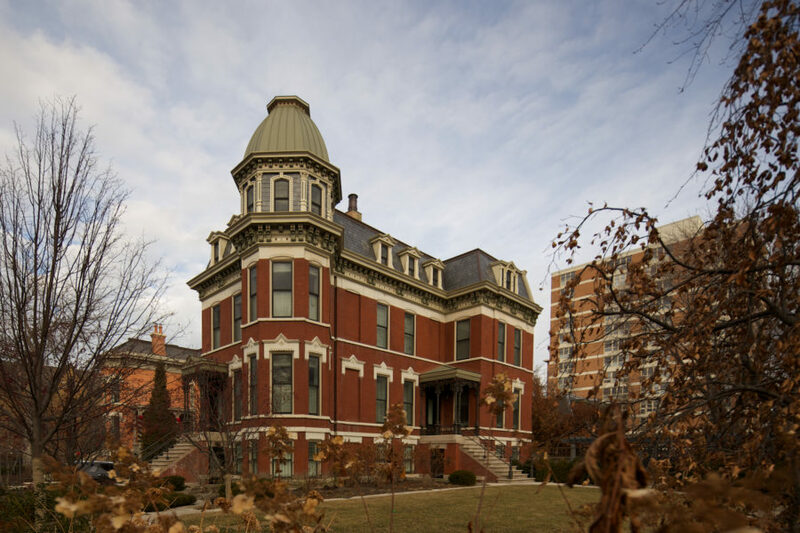 In 1990 the vacant building was purchased by the Dyrkacz family and gradually restored. 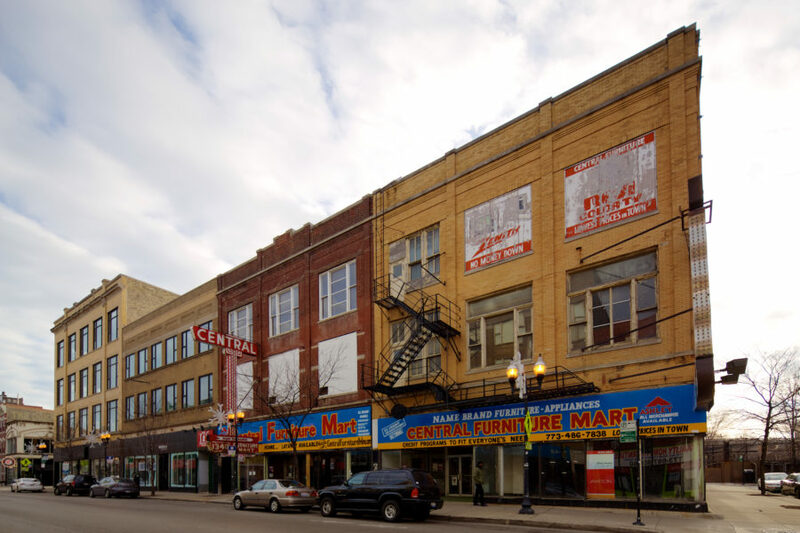 Today it houses a Main Stage (226), Cabaret Studio (50-100) with its Pregnant Buffalo Lounge, the Nelson Algren Café, East Wing Art Gallery and the office/residence of owners Zygmunt and Lela Dyrkacz. 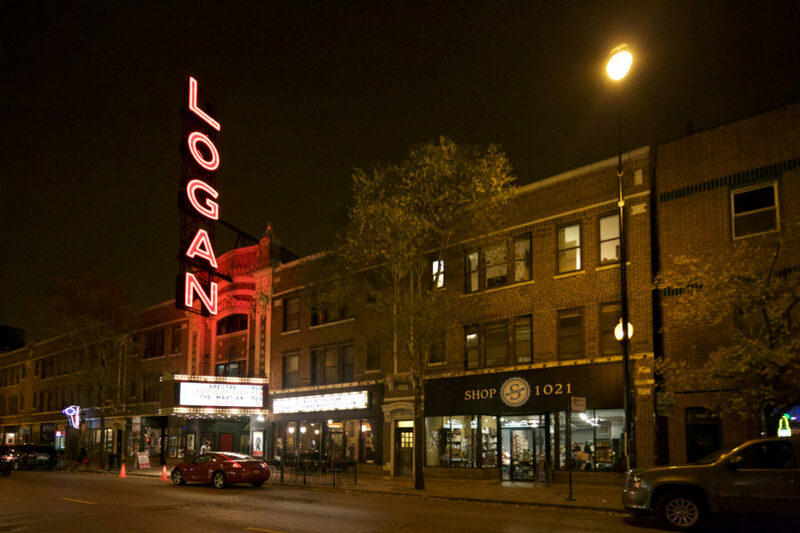 The Walter Ahlschlager designed Logan Theatre opened in 1915 in Logan Square. 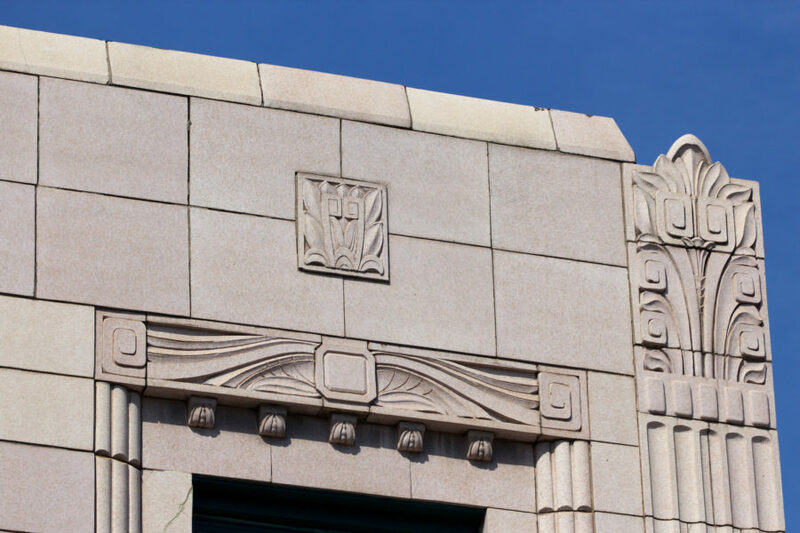 Renovations in 2012 revealed original interior Art Deco detailing. 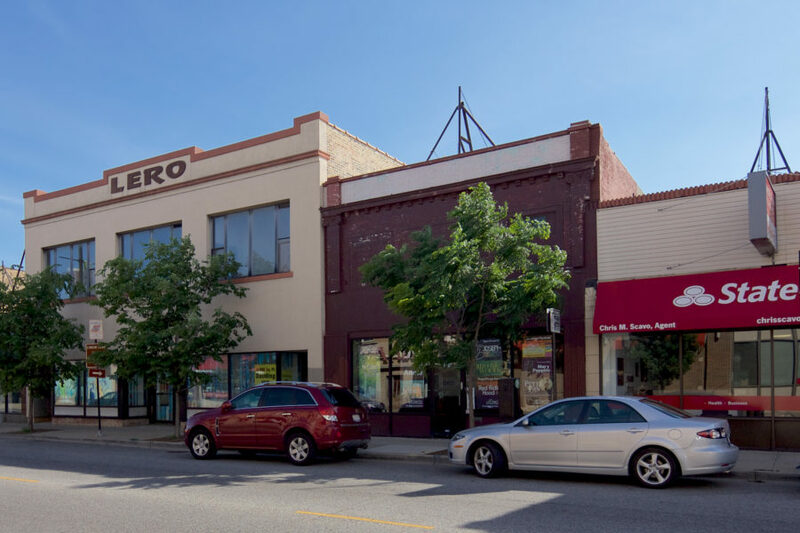 The Logan Theatre is captured in the first article published here, in Introducing Chicago Patterns, outlining the meaning of the name and goals of this project. In 1926, at the height of the movie palace era, the Congress Theatre opened to parades, a beauty contest, among other events. Prior to closing in 2013, it served as a music and event venue. After a series of dramatic neighborhood debates and disputes, new owners announced a $55 million renovation plan. The new owners are currently seeking a National Register nomination. 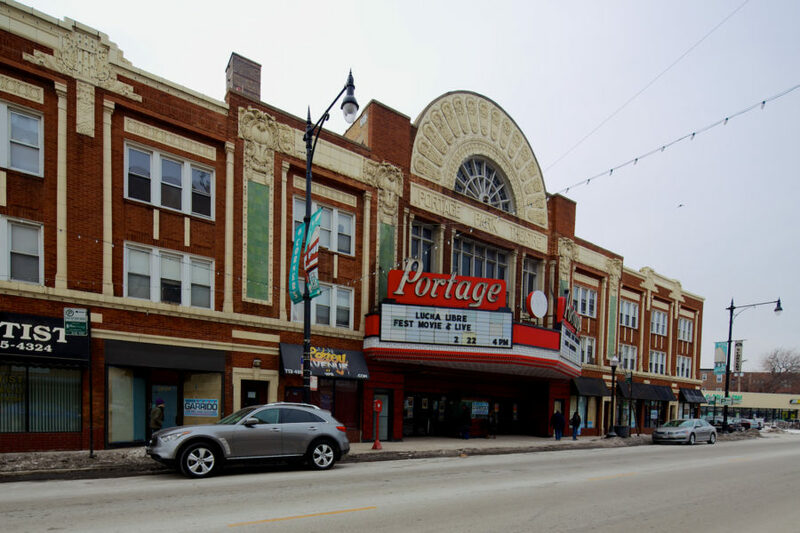 Portage Theater, the outermost theater in this Milwaukee Avenue history tour, is also one of the oldest in the city. It opened in 1920 with a Classical exterior and megaphone-shaped interior, before undergoing renovations in 1940 which added Art Deco styling to the interior lobby and entryway. 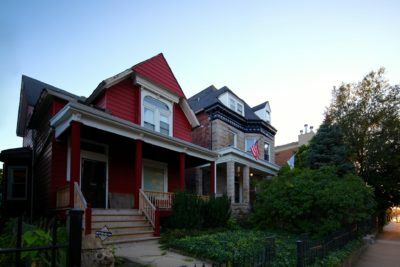 The evolution of architecture styles and types, with the study of immigration patterns of Milwaukee Avenue tell a story of arrival and social advancement. 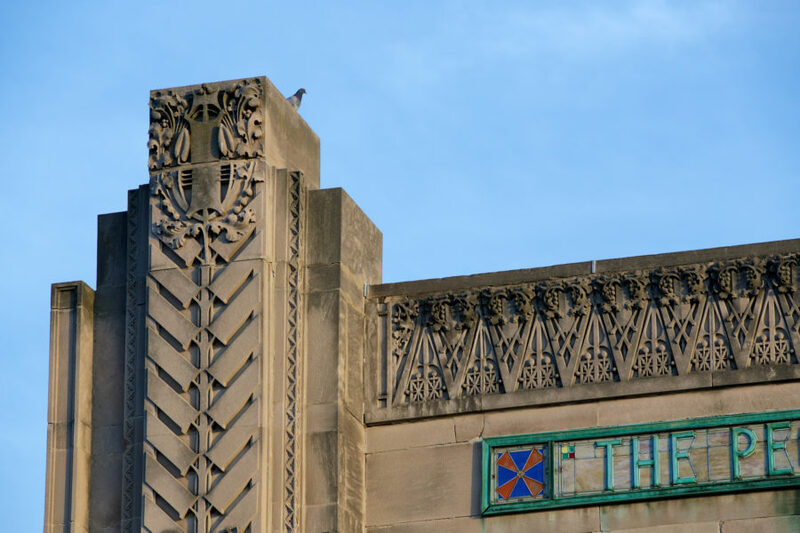 The next two parts in this series will highlight its status as a living history book of organically-derived Chicago architecture and later, the arrival of Art Deco and the Machine Age. In the next article, we’ll explore architecture of the Chicago School along Milwaukee that arose around the turn of the century, as well as the later Sullivanesque style that bloomed along Milwaukee in the 1920s. In part 3, we’ll look at how the built environment evolved from the heady days of the late 1920s, the Great Depression and the post-World War II era. This era created a legacy modern design. The transition from classically inspired buildings to modern and futuristic design is unique in American history. There is much more to come on Chicago Patterns with regard to this history of Milwaukee Avenue. 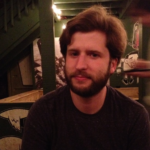 If you have memories, photos, or information about Milwaukee Avenue, please let us know in the comment section. Excellent article showing the progression of Milwaukee Ave. There are still some remnants in the suburbs of the name Indian Trail especially in Lake County.Thank you for highlighting some of the architectural high points along the way. So many are lost amidst the billboards and neon signs and other visual “debris”. 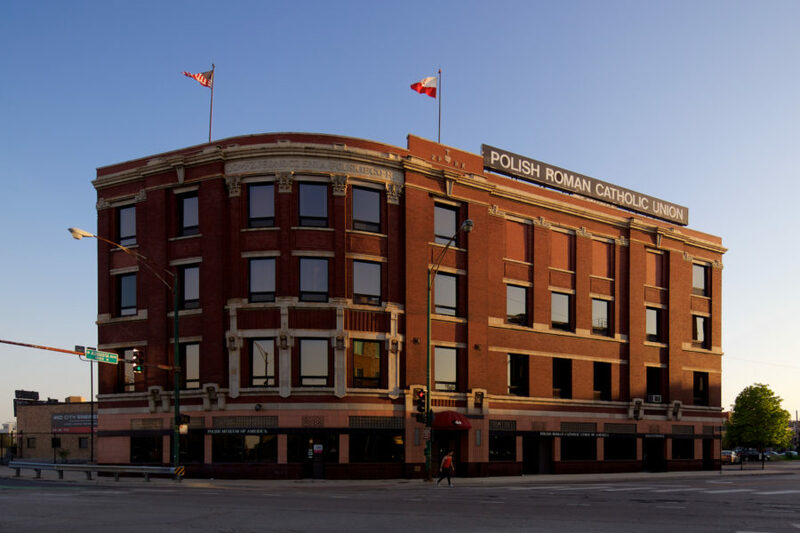 My great grandparents owned a polonia restaurant around Milwaukee Avenue. (possibly north Milwaukee Avenue) Thank you!